Dated from pre-Bronze Age. Legend has it that when the Greek gods went to Mt. Ida in Turkey they returned with raspberries. The delicate unique flavour, with the fragrant bouquet, still makes raspberries a favourite with fruit lovers today. An excellent variety for home gardener. Ideal as a edible screen or grown through a pillar rose support. Top antioxidant food; high in fibre, vitamin C and folate. Fresh is best, sweet delicate fruit straight off the canes. Divine!! Extra and soft fruit use in jam desserts, smoothies and sauces. You can never have too many raspberries especially with children. Plant two plants per person. Open sunny position. 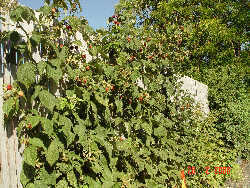 In northern areas plant to protect from afternoon sun. Exposure to wind is not a problem but will not tolerant salt. 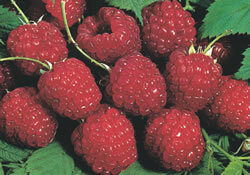 Chilling hours are needed to set fruit but if you can grow apples you can grow raspberries. Soil rich in organic matter with good drainage is essential. Use raised beds if drainage is doubtful. Roots are close to surface so will benefit from mulching with organic matter and regular watering during dry periods. Mulch well each winter with compost and manure. Apply general fertiliser in spring. Never spray near harvest. For fungal diseases spray on dormant canes and at bud burst. Use bird netting for the birds.